The mimosa trees are starting to bloom…. I have loved these pretty trees since I was a kid in southeastern Virginia…this one is blooming right up the street. I’ll take my iPhone along on runs so I can listen to tunes, but about once a week I get distracted so much by the pretty flowers, I stop to take some pictures with the iPhone camera. It does a pretty decent job. So I took several pictures of this “mimosa” tree and was all set to write up not just about the tree, but also about the delicious Sunday brunch staple: The Mimosa. I’ll get to that particular Mimosa in a minute. In case you hadn’t noticed after all these years, my posts about pretty flowers, cool trees or curious critters on this blog never lack at least a cursory round of research and web links for you to learn more. This will be no exception. Right away, I learned that these trees I’ve called “mimosas” for decades aren’t really “mimosas”. They’re Persian silk trees. 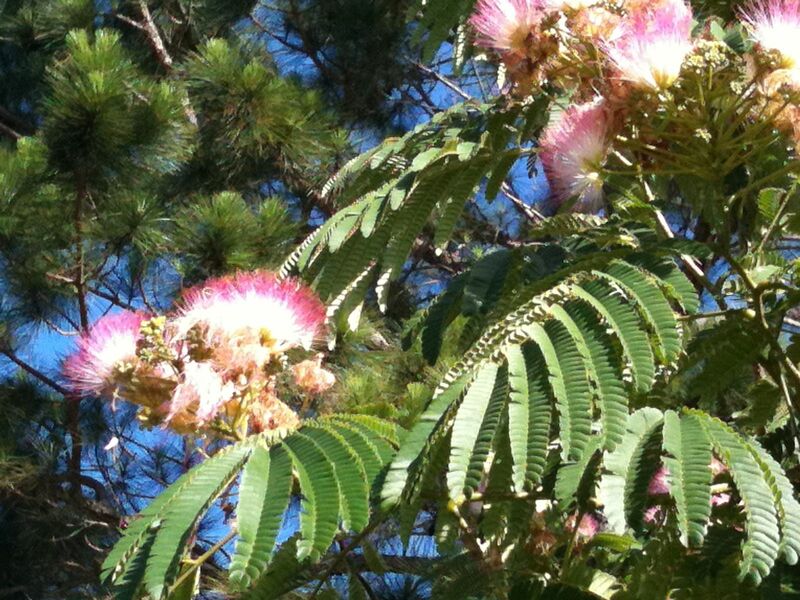 The geneses Mimosa and Albizia are both in the family Fabaceae. Many folks are familiar with the mimosa species whose flowers quickly contract when touched. 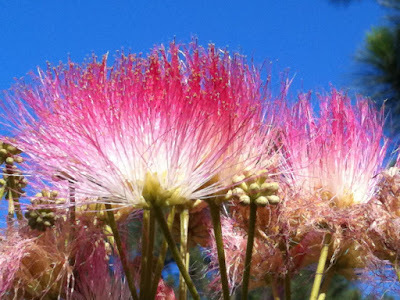 You might know it as the “Sensitive Plant”, botanically known as the Mimosa pudica, seen in this video (you will get the gist of it in the first 10 seconds). It seems so theraputic, doesn’t it? Okay, okay, since the point here is that this ISN’T a mimosa, let’s focus on what this IS. According to my buddy Wikipedia, the Persian silk tree is native to much of Asia, from Azerbaijan to China to Korea. It was brought to the U.S. in the 18th Century as an ornamental tree and has become an invasive species in the eastern U.S., particularly in the northeast and Mid-Atlantic states. 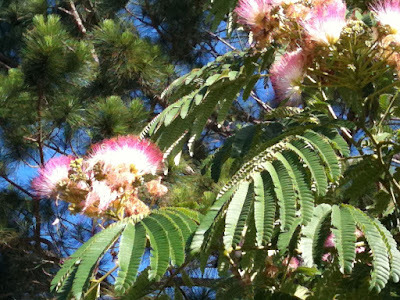 It is commonly confused with both mimosas and acadia trees, because of the similar patterns of their respective leaves. In true Internet-geek fashion, a short series of click-throughs led me to the Florida Exotic Pest Plant Council, whose mission is to manage the spread of invasive species in Florida’s natural areas. Every two years the Council publishes a list of Florida’s invasive plants, placing each species in a Category I or Category II. Category I is more dire, meaning the species is capable of altering a natural ecosystem if left unchecked. 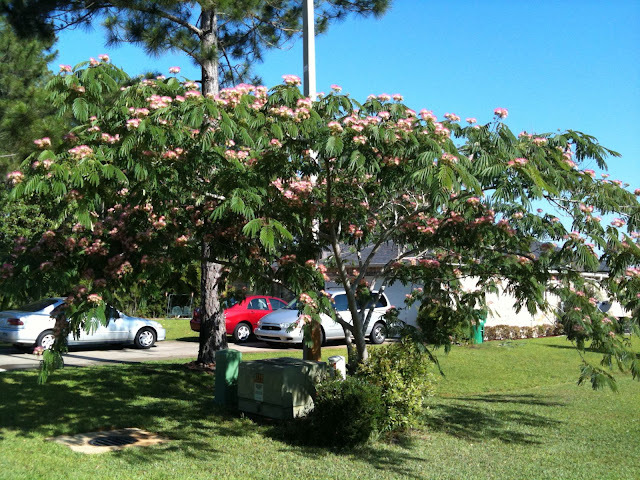 The Persian silk tree is a Category I invasive species. Nonetheless, I grew up thinking these trees are so pretty, and I won’t change my mind on that. What I WILL change my mind about is trying to get one for my own landscaping one day. 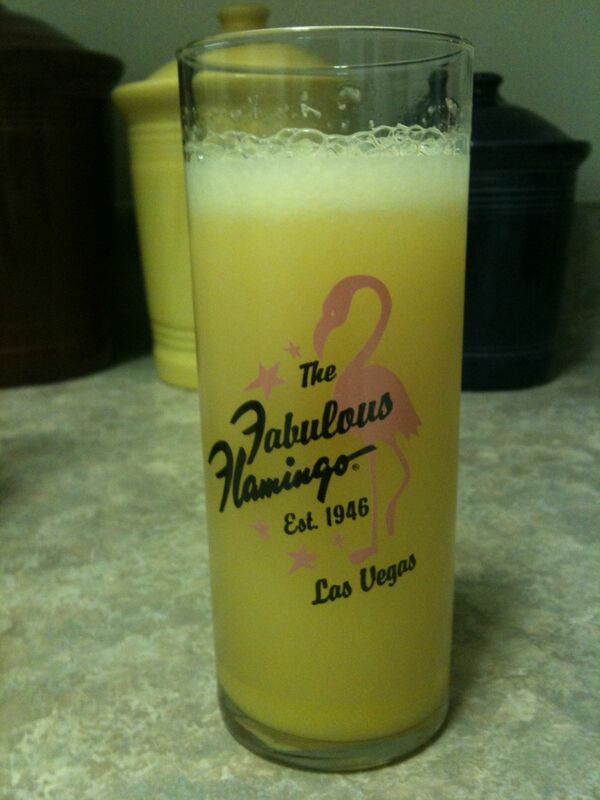 Let’s shift gears and talk about another Florida Discovery my Dear Husband and I have made: The Mimosa. (That’s Mimosa with a capital “M”). Within a week or two of our arrival, our family had a hankerin’ for some seafood, and ventured out to Pensacola Beach, where we were met with several choices. We chose a touristy joint called Crabs — We Got ‘Em. It was Sunday early afternoon and we were given a brunch menu that included several brunch-ey entrees, and all-you-can-drink Mimosas! We ordered right up and the Mimosas were so delicious! Now Dave and I want to keep a bottle of inexpensive Champagne on hand just so we can enjoy them on weekend afternoons. So what is in a Mimosa? Very simply put, mix equal parts Champagne and chilled orange juice in a Champagne flute. Stir and serve with a light brunch. Enjoy some history behind this drink. Or this history, which also mentions the “Buck’s Fizz”, which is a very similar beverage. In our house, we enjoy “Indian River”-brand orange juice, which is found at our local Publix supermarket, at a cost comparable to other national brands, but is MUCH more delicious! Like the glass? One of our Vegas souvenirs from 2006. We stayed at the Flamingo. I don’t have any champagne flutes.